We show you some of our favourite classic motorbikes from the upcoming Gosford Classic Car Museum Closure! Owning only one motorbike just isn’t enough anymore for a lot of bike enthusiasts! They can have a daily driver to whip around the streets on, but many also love the idea of a ‘Sunday Bike’, something to tinker around with or take for a cruise on a sunny afternoon. Not only does the largest privately-owned classic car collection ever to be auctioned in the southern hemisphere feature some stunning cars, but it has an array of over 20 impressive bikes spanning a history of more than 80 years! This is a rare opportunity to see a collection of iconic names together like Douglas, Ducati, Parilla BMW and of course, Harley Davidson. We have chosen six of our favourite bikes as a taster of what’s to come in this incredible auction. Douglas claim to be the first to produce a flat-twin motorcycle engine and were a big name in the industry throughout WWI, producing and supplying 70,000 bikes for military use. They ceased production in 1957 after 50 years in the business. This 1924 Douglas C.W was lovingly restored in the 80’s and is now in beautiful condition. At 94 years old it features plenty of unique, old school points of interest such as acetylene lighting, belt drive, brass air horn and leather luggage bags. Sporting a 350cc horizontally opposed flat twin engine paired with a 2-speed gearbox, this light frame was impressively fast in its day! This is a rare bike in fantastic condition and really is an opportunity to own a piece of history. At almost 100 years old, it will make for a great investment and talking point for any collection! The historic Parilla motorbikes were made between 1946 and 1967 in Milan, Italy and were founded by Giovanni Parrilla. When this bike was built in 1955, Parilla had seriously established themselves as a major force motorsport scene and had an extensive array of road bikes too. This 175cc 4-Stroke beauty sat in the very heart of the Parilla range. This bike has loads of character! This particular classic bike features Akront rims fitted with Ceat Italian tyres and a Giuliari black leathered seat that is rare to be found in a condition as good as this! Finished in an orange and cream colour combination that proudly stands out against the polished chrome, this fantastic vintage bike is in amazing condition overall. This largely original Parilla Turismo runs excellently. Imagine taking it to the famous Motogiro D’Italia! This BMW is a gloss, jet black classic. Stunning to look at, and also highly desirable to collect! The first BMW motorcycle, the R32 had an engine design that was nicknamed the ‘boxer’. This engine has been the foundation of all opposed twin BMW motorcycles, including this R75/5 and has also continued through to many of their current bikes on the market. The /5 models were limited in production as they were only built for three years before getting replaced in 1974. The /5 series was built with a range of revamped engines available in 500cc, 600cc and 750cc. This relatively short model run makes this R75/5 a rare and collectable piece. A flat twin layout offers a low centre of gravity and also features a longer swingarm that improves handling. The 750cc engine means this R75/5 can reach speeds of up 177kph! The early Ala d’Oro (gold wing) racing bike proved fast and competitive, and during the 1960s Aermacchi continually updated it. The Ala d’Oro eventually grew to 350cc as seen in this particular example. The horizontal engine layout provides a low centre of gravity and shows off the finest features of a 4-stroke single. From Aermacchi’s racing stables, this Ala d’oro is immaculate and race ready. This stunner has been meticulously rebuilt to be a period correct racer. The engine was rebuilt by Bruschi Racing with only 3 hours on the clock since the rebuild! Successfully competing in speed record events and circuit racing and achieving numerous podium finishes in its day, these bikes are now highly collectable. Ala d’Oro race bikes like this one rarely come up for sale. This is the perfect opportunity for it to be taken classic racing or to add it to a collection. Since its birth in 1901 in a tiny shed in Milwaukee, USA, Harley Davidson has arguably become the most iconic and well-known motorcycle brand to this date. Harley Davidson released the XLCR as a factory-built Cafe Racer in March 1977 at Daytona bike week. It was like nothing like fans had seen before and although it seemed to receive enthusiasm at the time, the sales were somewhat of a disaster. The XLCR went on to be produced in limited numbers for 1978 and then discontinued. Only about 3200 were built which makes this hog a highly sought-after piece of Harley Davidson’s rich history. The 1000cc Sportster engine is mounted on an XR frame with a performance Siamese cross over two-into-two exhaust, and suspension by Showa of Japan. Sporting an elongated angular tank, bikini fairing, cast alloy wheels, twin discs up front with Kelsey-Hayes brakes, this is a serious collector’s item nowadays. This particular Harley is presented as it would have on the showroom floor over 40 years ago. It is in pristine condition and only shows 229km on the clock! The Ducati 1000 LE – Paul Smart (PS1000LE) is a bike built to commemorate Paul Smart’s milestone win at the Imola 200 race in 1972. This was a defining moment in Ducati’s approach to racing. 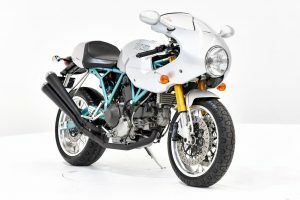 This Ducati is part of the Sport Classic series designed by Pierre Terblanche. He started with a standard Sport Classic Sport 1000 model and added the visual elements of silver paint on the plastics and, of course, the iconic green painted frame. Chuck in adjustable Öhlins front and rear suspension, a steering damper and lower clip-ons, and this bike has distinction over the other Sport Classic models. This beast is powered by a 992 cc V-twin cylinder engine which features Marelli injectors and is connected to a 6-speed transmission. With only 2000 Ducati 1000LE Paul Smart editions ever built, this nostalgic bike displays great investment potential. This Ducati is ready to be enjoyed as a daily rider or shown off in a garage!